Pass the gravy, corn, turkey, ham, stuffing, stockings, presents, you name it—Thanksgiving and Christmastime in America have become the time to celebrate the gift of excess. But is that the best way for Christians to participate in the holidays? 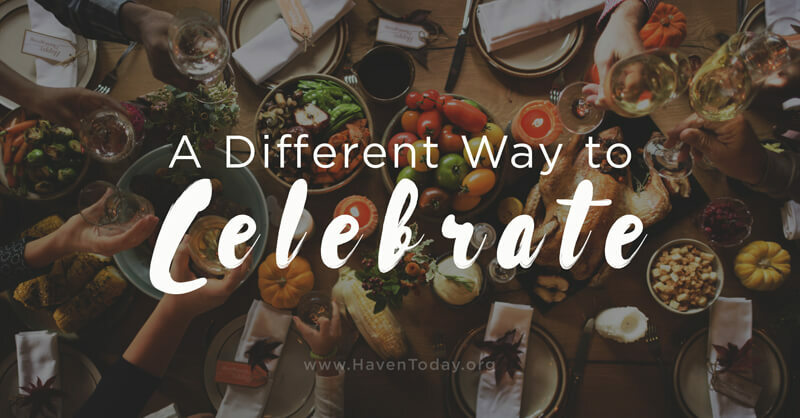 Charles Morris, President & Speaker of Haven Today, sat down with the Phil Vischer, creator of VeggieTales and What’s in the Bible?, to discuss an alternative way to celebrate Christmas and Thanksgiving than what we usually do from year to year. 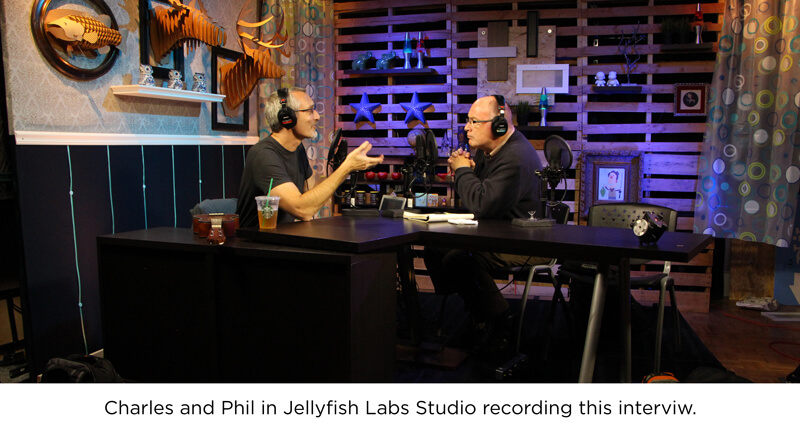 Charles: I’m sitting with my friend Phil Vischer in his studio just outside of Chicago. Phil, can you tell me how you and your family celebrate Thanksgiving? Is it a busy time? Phil: We associate holidays with family. Now that’s tricky, my parents divorced when I was 9-years-old, so I have a mom and a dad and a stepmom and a stepdad. And then my wife, her parents are divorced, too, so she has a mom and a stepdad. Charles: I hate to say this, but you come from a traditional American family at this point. Charles: … and not get in a fight with each other. Charles: But isn’t that interesting how it’s Thanksgiving and we’re supposed to be thankful, I’m sure your family prays, my family prays, we chow down, and then we look for a game to watch. But how does Christ make an entrance? Charles: Is it hard for you and your family? Charles: And let’s pause for just a moment because maybe that’s something we should touch on just a little bit. Because typically in most homes when I’ve celebrated Thanksgiving, it’s giving thanks for what God has given us. But do you think we’ve sort of mis-aligned the way we’re supposed to think of Thanksgiving as believers? Phil: We don’t know how to think! Phil: I think we’re just misinformed and mis-confused. Our culture loves special occasions because you can build sales around them. You know, how many people are all excited about Columbus Day? No one is more excited about Columbus Day than the sellers of mattresses and cars. Phil: They love Columbus Day! That’s the biggest day of the year for them, and I have no idea why. So with Thanksgiving, our culture makes it important for us and tells us why. Thanksgiving is important because you have a parade in the morning and football in the afternoon and then you get ready to shop. Charles: Yeah, because so much money is being poured into this Christmas initiative. Phil: Because Christmas is all about the giving of the stuff you started buying at Thanksgiving. Phil: It is so counter-cultural to just say “stop!” The more concerning part of Thanksgiving for me is that it’s now become just about excess. “I ate so much more than I should have …” [chuckles] … in celebration of what? Well, once upon a time, if you only got meat once or three times a year. Charles: Well, at the time of Jesus they didn’t have a lot of meat. They were pretty much vegetarians. Charles: We are going to have three or four varieties of meat unless we are vegetarian! Phil: We have feast days almost every day! So you have to really figure out what’s so special about this Feast Day. And just to take your family back to thinking about God. Remember the first official Thanksgiving in America in1863? The first real one? Charles: Yes, yes. Not the pilgrims. Phil: Not the pilgrims. Abraham Lincoln, when he made it a national holiday, the first national Thanksgiving, it was in the middle of the Civil War. What was he thankful for? Charles: And you’ll have to tell me because I don’t know, even though I’m a Lincoln fan. Phil: His focus actually wasn’t about “Look at all the stuff we have” or “Look at all these blessings you showered upon us.” His focus was the families of people that had lost loved ones. He basically said, “let’s just stop.” Let’s have a day of thankfulness of God and pray that he can deliver us out of this. Charles: Wow. Sounds like a good reason to have a Thanksgiving like that today in our chaotic world. Phil: If you can have Thanksgiving in the middle of the Civil War, it’s gotta be deeper than look at how much stuff we have. Charles: Exactly. And that’s also a way to point to Christmas, too. Phil: Ah, yeah. What if you can’t afford presents? Charles: Which most people can’t. Phil: Then what do you celebrate? It gets harder as the cultural expectation gets even greater to outdo yourself on Christmas, to outdo yourself on Thanksgiving. Charles: I hear you. Yeah. Phil: And if you’re having tough times, that’s filled with dread. It’s not filled with joy. Charles: So, Phil, what should we do? How do we stop this? Phil: You know, there are families who on Thanksgiving go to a homeless shelter and feed the homeless instead of feeding themselves. Charles: Yes, they help serve by peeling potatoes and whatnot, yeah. Phil: We did that once with our kids, we’ve only done it once. But even if you only do it once or twice, it puts in your kid’s mind a completely different counter-cultural experience. Charles: They won’t forget it. Phil: Now if they never get a traditional Thanksgiving, they may begin to resent you and it may come up in counseling when they’re grown ups. Phil: But to make things un-traditional sometimes, just to say it can be different and here’s how. Let’s focus on others. Here’s a way this Christmas (or Thanksgiving) we’re going to focus on others. You know the families that give gifts to other people instead of just themselves? They donate a goat to a family in Africa that supports the work of people working with the homeless. There are things that you can do that are so counter cultural they will stick with your kids forever, even if you don’t do them every single year. Charles: It’s the same with going on a mission trip, but it’s something we can do where we are. So, Phil, how do you think we ought to pray? And I’m not asking you for five simple steps that you’re going to tell everybody “this is what my family does.” You’re in desperate need like I am and probably most everybody listening to me. So how do we pray? Phil: How do we pray on a Thanksgiving? Charles: Yeah, how do we pray with Thanksgiving, Black Friday, and Christmas coming? Phil: We remember that this is not our home. This culture, you know, we are exiles. Not in the sense that there isn’t going to be a new heavens and new earth and we’re going to be swept away to a new planet somewhere, not that kind of exiles. But exiles in that we are not under the rule we were made to be under. We are not under the rule of the Kingdom of God, we are under a disordered rule in our culture. And when you try to fit in and you try to make the culture work, you’re just banging your head against a wall. But we need to back up and say, no, we’re in a different kingdom. Charles & Phil together: The now! Phil: Not just the not yet. If we’re in a different kingdom now, what does that look like for us? It looks like love. The easiest way to sum it up for your kids is that the Kingdom looks like love. So eating as much as we possibly can and then falling down on the floor, does that look like love? Does begging for as many presents as you can possibly get, spending as much as you possibly can, putting money on credit cards so you can get more gifts, does that look like love? Is this the Kingdom of God? And how do we look like that? How do we look like love to our neighbors because they may have just gone through something that Thanksgiving or in the holidays that destroys their lives. Charles: I guess what I hear you saying is, if we have neighbors on either side of us or above us or below us if we’re in a city, we should be thankful. We should be planning for Christmas. But if we’re doing it exactly the same way as those unbelieving neighbors are, we’ve got it wrong. Phil: There is nothing that they would notice about us that would say I need what you have. Phil: Several Christmas’s ago, Christmas took place right after the Sandy Hook shootings. And it was a tough time because some people literally took down their Christmas decorations. They said, “I can’t do this.” And I talked about it at the time saying this is exactly why we need to be celebrating Christmas because Christmas is God starting his plan to bring the end to all of this suffering. That is what we are celebrating: God entering into our pain, entering into our Sandy Hooks and saying, “Alright, here is how I’m going to solve this problem.” It’s starting today. Merry Christmas. That’s what we tell our neighbors who are taking down their Christmas decorations because their’s no jolly left in a broken world—it’s not about the “jolly,” it’s about the Jesus!